The arrival of bright yellow Daffodils, warmer air and adorable newborn lambs means Spring has definitely sprung. I just love this time of the year, even more so because of Easter weekend! Easter for me is about bringing together the whole family to celebrate the beginning of a new season and it’s exciting future. Oh and did I forget to mention the food? It’s also about eating lots & lots (& lots) of good food and chocolate! For this blog post I wanted to create a dessert that the whole family could enjoy after Sunday lunch. These little vanilla cheesecake-filled milk chocolate eggs have a punchy lemon curd yolk and a side of lemon shortbread soldiers. Now if these fail to impress the family then I don’t know what will. The recipe is very easy so please try not to be put off by the length of it. You start by making your shortbread soldiers by combining flour, butter and sugar, cutting it into fingers and baking it in the oven. 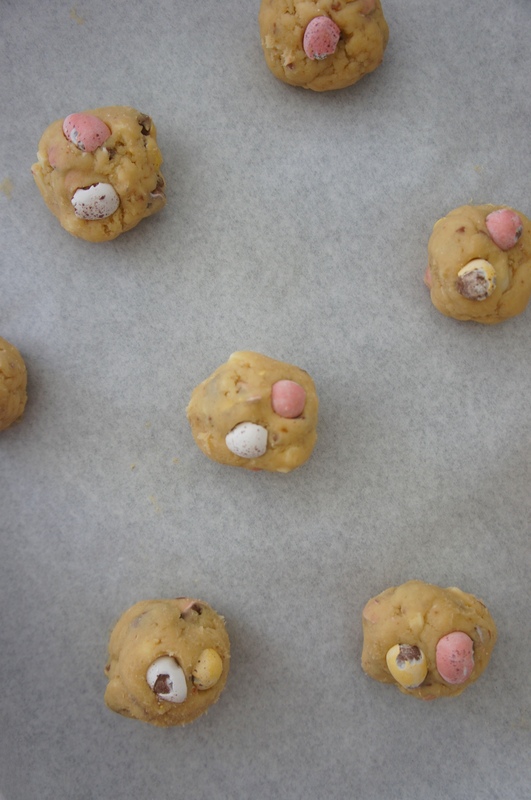 Then you move onto the fun part… the eggs! 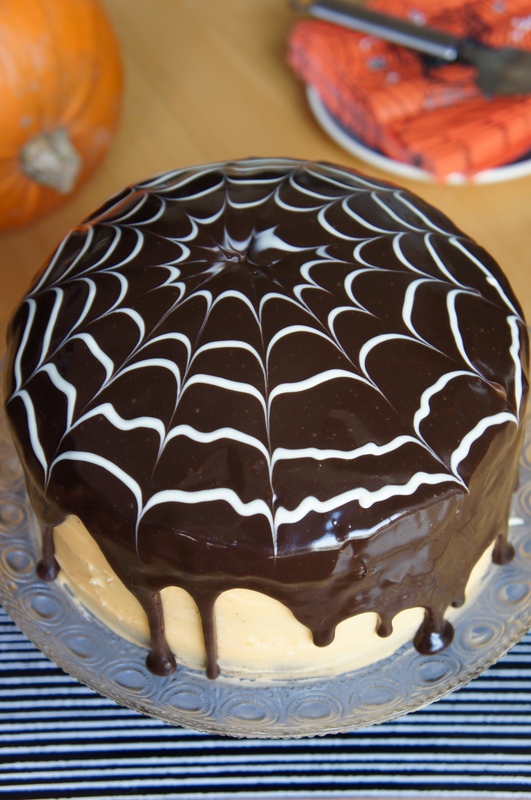 This cake is definitely one of my best bakes to date… three layers of rich, moist chocolate cake, sandwiched together and smothered in sweet buttercream, drizzled with creamy milk chocolate ganache and decorated with a white chocolate spiderweb – delicious! You can find this recipe here on the HomeStyle website. 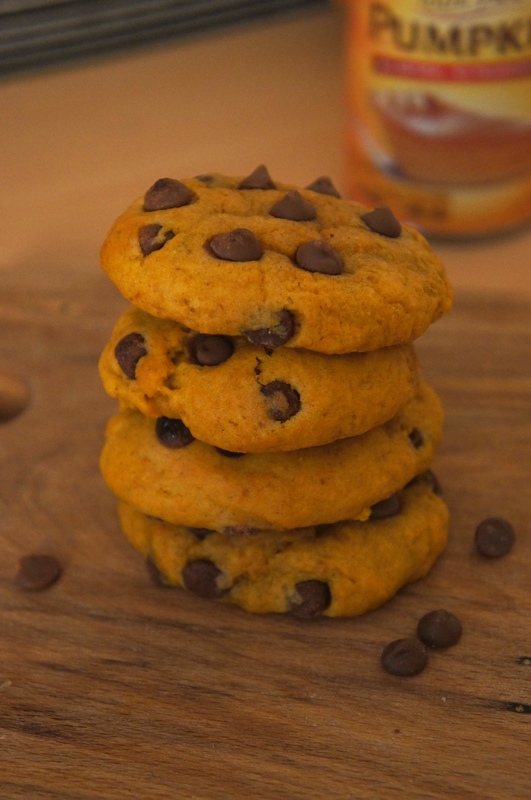 This recipe uses pumpkin puree and cinnamon spice to give these cookies a real taste of autumn. 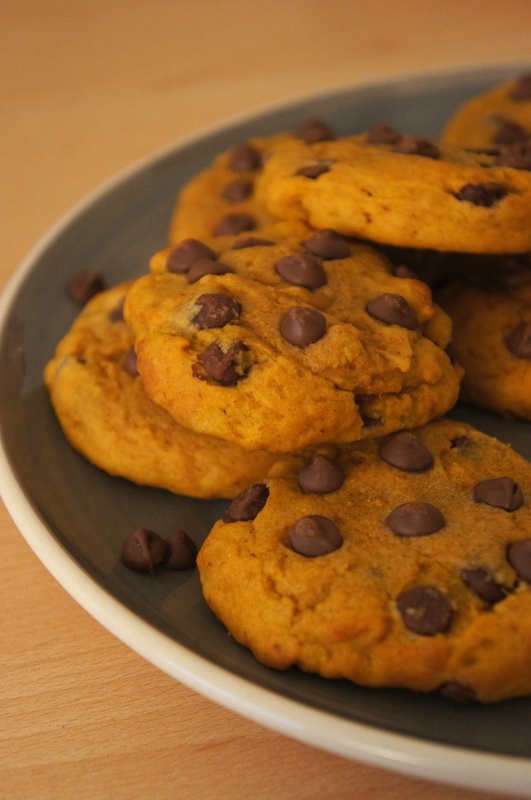 Chocolate chips are added for sweetness and to complement the pumpkin flavour without overpowering it. 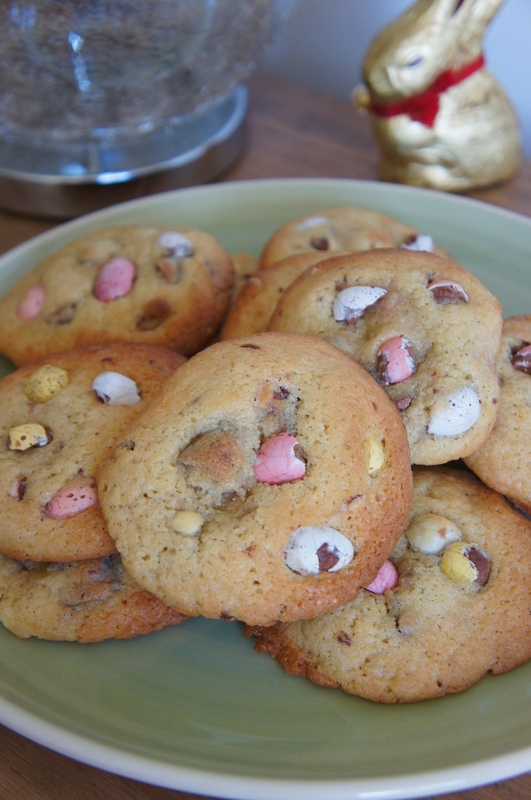 These cookies are thick and puffy, the edges slightly crisp and the centre soft and chewy – just how a cookie should be! 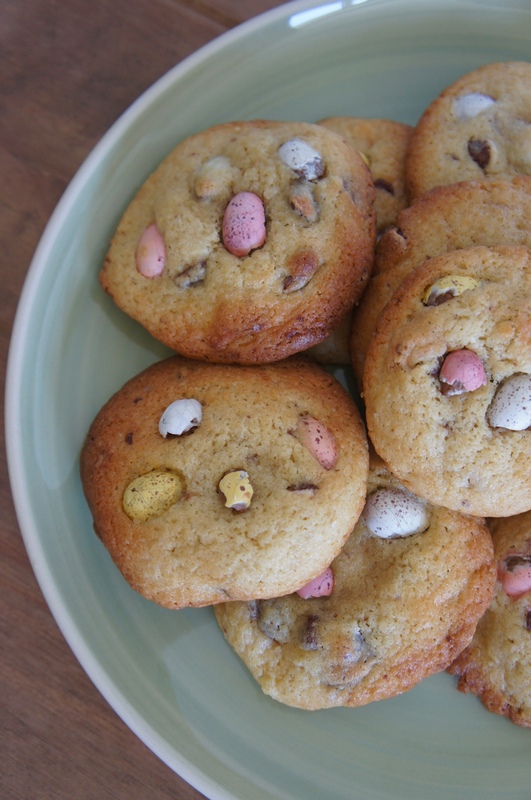 Check out the recipe here ,on the HomeStyle Magazine Blog, for a step by step guide on how to make these cookies and my top tips on achieving the perfect texture every time. 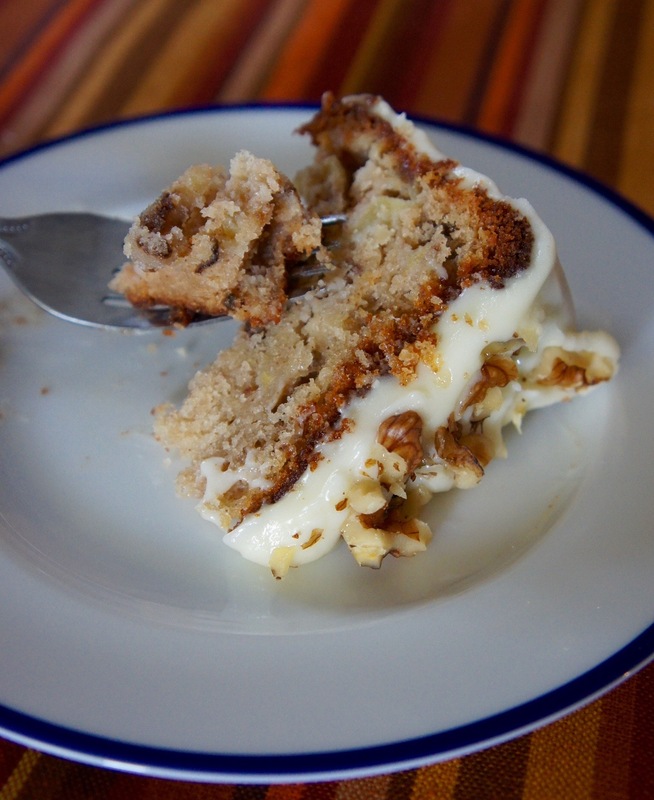 Deliciously moist sponge, jewelled with walnuts and apple and finished with a thick layer of creamy frosting and a scatter of chopped walnuts. 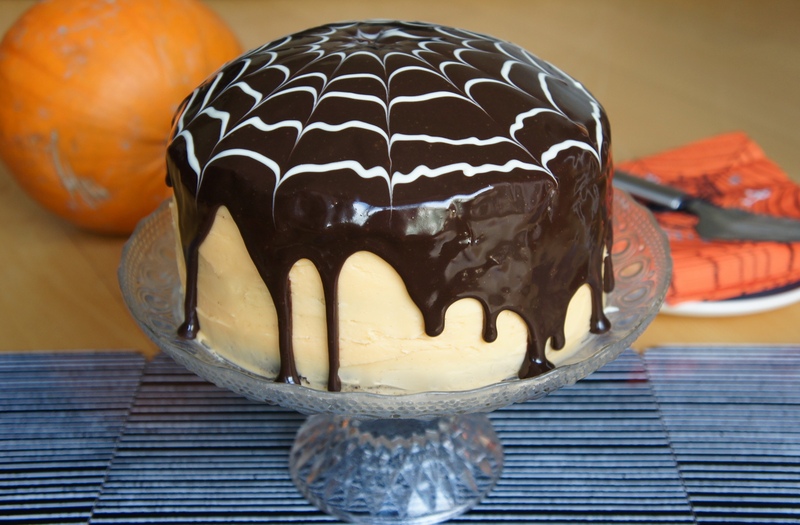 Mmm this cake is awesome! September is a great month for apples with 14 varieties ripening between early September and late October. So why not steal this apple opportunity to bake something? For this recipe I’ve used Granny Smith apples, as they are particularly sweet and juicy in September and lend themselves to baked goods. 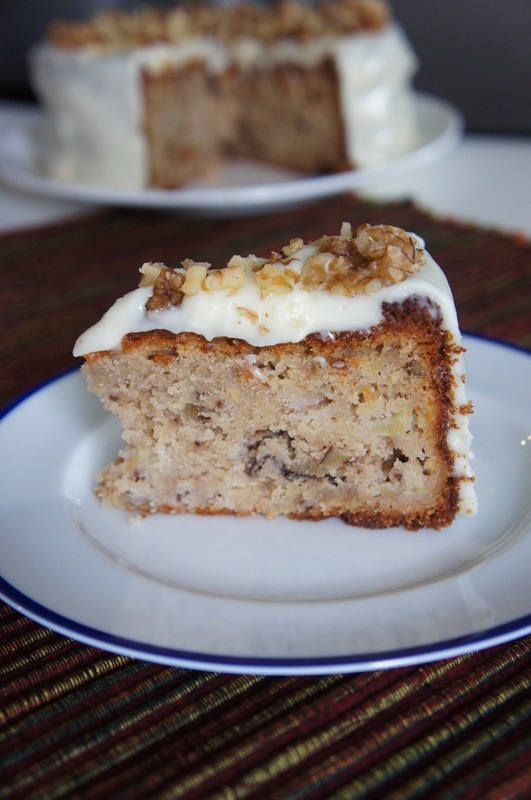 Cinnamon, vanilla and honey are added to complement the apple flavour and the chopped walnuts add a crunch throughout. Every bite tastes like Autumn! I’ve coated the cake in sweet, tangy Cream Cheese Frosting; the ideal companion to any fruit or vegetable cake. Just be sure to remember that all the ingredients are at room temperature before mixing, there is nothing worse than split and grainy frosting – more about this in the recipe below. To finish I covered the top of the cake with chopped walnuts, however feel free to decorate however you wish. It is important to use full-fat cream cheese as the low fat options are too loose in texture and will result in a runny frosting. Preheat the oven to 170°C and grease a 10inch round cake tin with a little butter. In a large bowl cream together the butter and sugar until pale and fluffy. Break in the eggs one at a time*, mixing well before adding the next egg. In a separate bowl sift together the flour, cinnamon and baking powder. Add ½ of the dry ingredients into the batter and mix until fully combined. Repeat with the remaining dry ingredients. Now add the yoghurt, vanilla essence and honey and mix until all ingredients are fully incorporated. Finally fold in 80g of the chopped walnuts and the chopped apple. Pour the batter into the cake tin and bake for 55-60 minutes and until the top is golden brown and a skewer inserted into the centre comes out clean. Leave the cake to completely cool before removing from the tin and transferring to a cooling rack. To make your frosting, first beat the butter for a good 5 minutes until smooth and free from any lumps**. Now drain of any excess liquid from the cream cheese and beat into the butter until just combined, be careful not to over beat. Sift in half the icing sugar and beat together. Add the remaining icing sugar and beat again until light, fluffy and pale in colour. If the frosting appears too runny then put the bowl in the freezer for 5 minutes to firm it up. Spread a thin layer of frosting over the top and sides of the cake and put in the fridge for 20 minutes to firm up***. 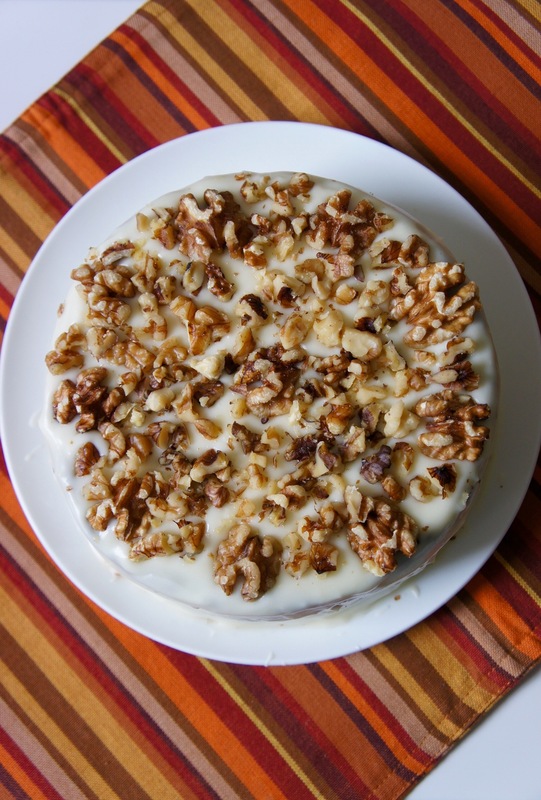 Take the cake out of the fridge and spread the remaining frosting all over the cake and finish by dotting the remaining 20g walnuts on top. *Don’t worry if your mixture begins to curdle, it won’t affect the cake and once the dry ingredients are added the mixture will come together again. **This step is crucial as it will soften and warm the butter sufficiently so it combines smoothly with the remaining ingredients. ***This is called a “crumb-coat” and will stop any crumbs from being pulled up when frosted again. Ever heard of HomeStyle magazine? If not, then you can find out more information here, but in short it’s everything you’ve ever looked for in a homes magazine. From cooking to decorating tips, design ideas to home bargains, you name it it has it! Your probably wondering why i’m telling you about this. Well I have some very exciting news… I am officially a monthly columnist for the HomeStyle online cooking blog eeeeeek! 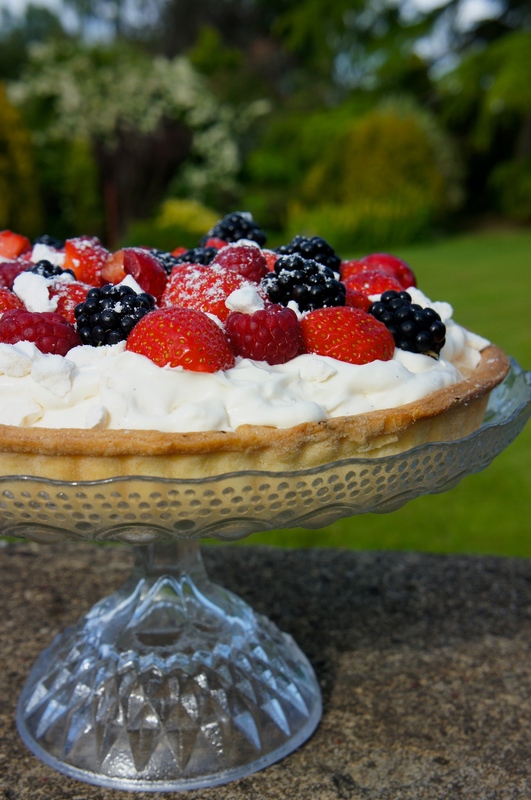 And I present to you my first post: Summer Fruit Pavlova Tart (click the link to see the blog post). This recipe is all about celebrating Summer. 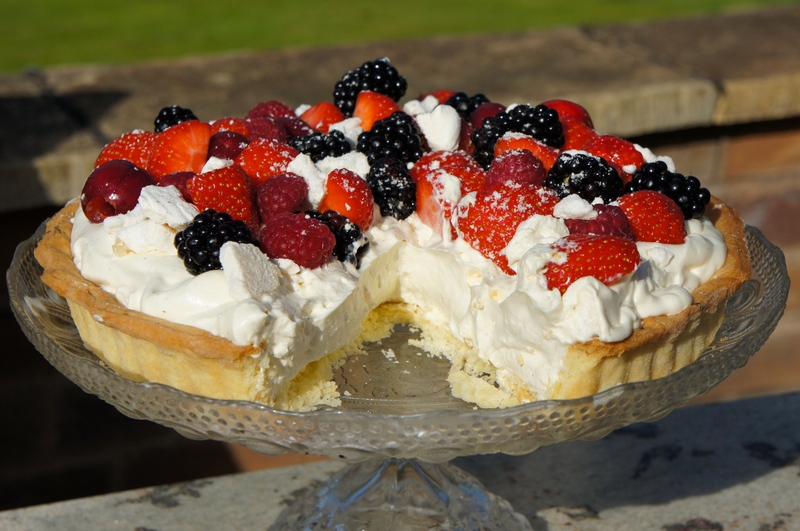 Even if it’s pouring with rain, a buttery tart filled with a creamy broken meringue filling and topped with sweet summer fruits is never going to go a miss. Now please don’t be put off by making your own pastry, it’s incredibly simple (particularly if you follow my top tips below) and the added lemon zest tops any shopped bought pastry. Try to be confident and bring the pastry together as quickly as you can – don’t knead it too much or the heat from your hands will melt the butter. Before making your pastry chill your mixing bowl in the fridge for 15 minutes and rinse your hands with cold water. This will help the butter stay cold resulting in delicate, flaky pastry every time. Don’t be tempted to skip the blind baking step, otherwise your tart shell will shrink. Mix the flour and icing sugar in a large bowl, add the cubed butter and work it in the mixture with your fingertips until it resembles rough crumbs. Now stir in the lemon zest. Add the egg and a splash of milk, just enough to bring the dough together, and knead it into a ball. Wrap the dough in cling film and put it in the fridge for 30 minutes. Once the dough is chilled pre-heat your oven to 180°C/350F and take the dough out of the fridge. Sprinkle a clean work surface and a rolling pin with a little flour and roll the dough out so it is about 5cm larger than the tin. Grease your tart tin with a little butter, before draping the dough over your rolling pin and laying it across the tart tin. 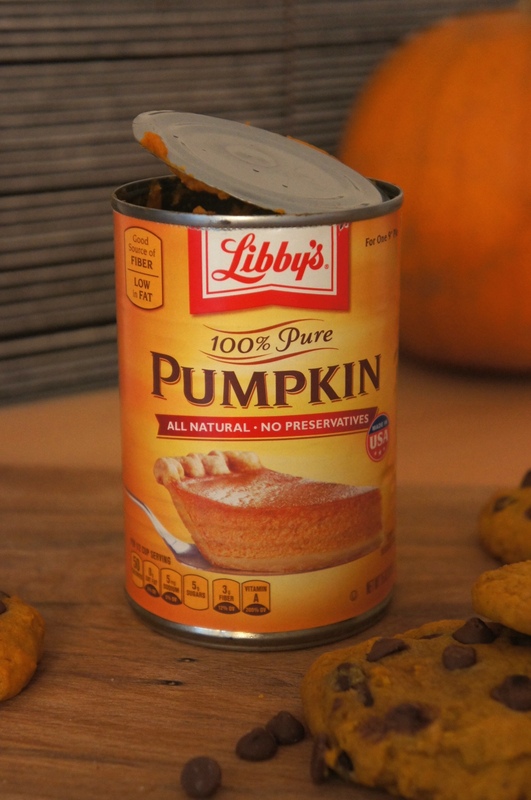 Trim off any extra bits and use your fingers to press the dough into the corners and sides of the tin. Prick the tart all over with a fork and line it with baking paper, pushing it into the sides. Fill the tart with baking beans or rice and bake it “blind” for 10 minutes. Take the tart out of the oven and lift out the baking paper and beans. Bake for a further 10 minutes until firm and golden. Leave to cool completely. To make your filling simply whip the double cream, creme fraiche, icing sugar and vanilla essence together with an electric whisk until soft peaks form (about 5 minutes). Mix in the broken meringue nests and fill your tart with the mixture. 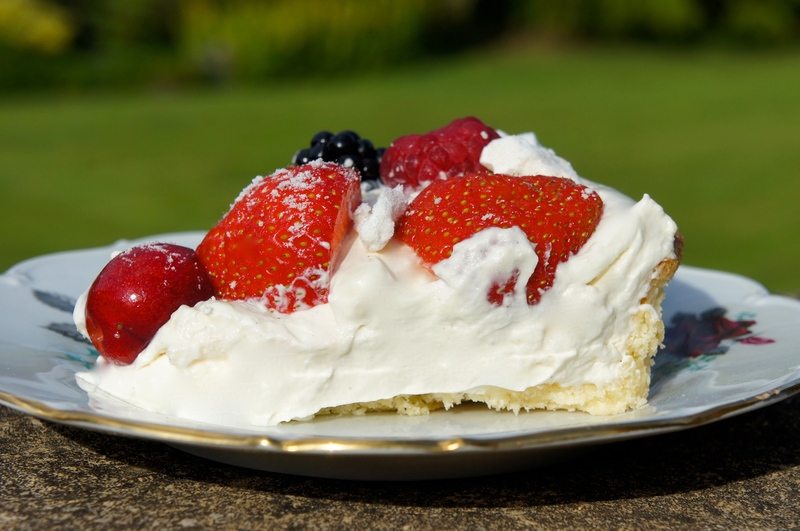 Finish by decorating the top with your mixed fruit’s and dusting over a little icing sugar. Keep in the fridge until ready to serve. Best eaten within a day or two.